These open sandwiches are actually not those delicious watermelony treats we love to enjoy on a hot summer day since there is no watermelon in them. But still, they are perfect for breakfast, Sunday brunch or even office lunch. The only problem is these sandwiches are calorie and fat dense, so healthy eaters and dieters will have to make some healthy ingredient swaps. When making open-faced watermelony sandwiches for breakfast, I skip mayonnaise and use low fat cream cheese instead of a regular one. Start with slicing your French bread diagonally into 1/4-inch slices. Brush them lightly with olive oil and place in one layer on a baking sheet. Bake the slices for 10 minutes or until they are crisp and a bit browned if you wish. In a medium bowl, combine garlic, mayo, cream cheese, and carrot and blend until perfectly smooth. Spread the mixture on your baguette slices. 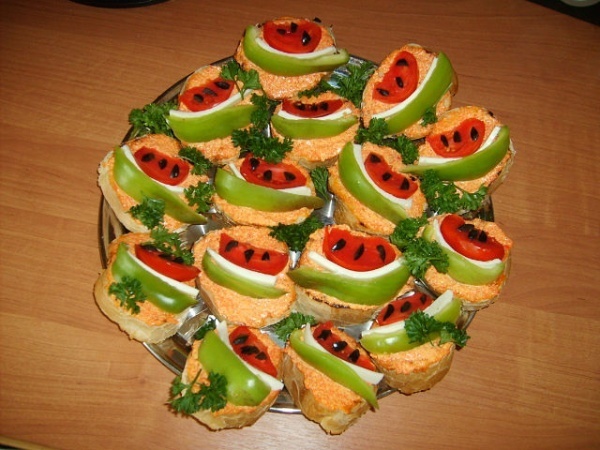 Now use tomato wedges, green bell pepper strips, olives and cream cheese (or processed cheese if you do not care about calories) to create your “watermelonies,” garnish with parsley and serve. Bon appétit!